Who uses laser scan micrometers? Aerospace, automotive, mold making, and medical companies are just a few of the end users of these extremely versatile and useful gages. Production companies of all types use them to monitor exact measurements live, in an assembly line. A laser beam is directed at a mirror, which is rotating a high speed and is synchronized by clock pulses. 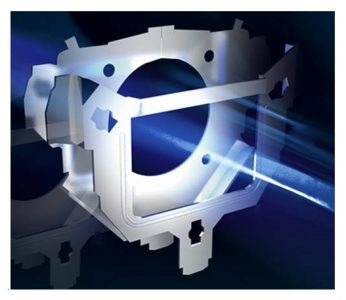 The reflected beam of light is aimed directly at the workpiece, and when the light is obstructed the output voltage of the photoelectric element varies. Once the receiving photoelectric cell registers the light, it measures the timed pulses generated by the beam obstruction. This determines the workpiece dimension. The amazing thing is that this can be done while the workpiece is moving or vibrating. Try that with a precision micrometer or dial indicator! For this reason, the laser scan micrometer is extremely useful in production lines, manufacturing cells, the precision measurement of delicate items such as contact lenses, and parts that are high temperature. These tools can be used as stand alone micrometers, or applied in an almost any imaginable set-up, such as a conveyor belt or manufacturing cell. By combining them with integrated software, external display units and operator panels, they can be the center of dedicated laser machining and control system. The can be directly connected to a PC, PLC or NC via standard ethernet or other interface. 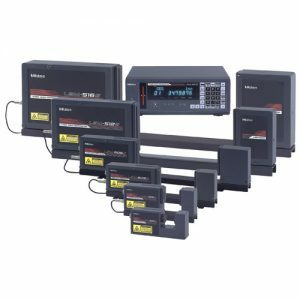 Any electronic unit equipped with such an interface can obtain accurate and fast measurements. This information can then be input into a specific program in order to perform any specific task, creating a complete laser scanning measurement system. Companies that specialize in laser scanning services are in high demand performing task such as set-up, calibration, maintenance, sales, and equipment repair. Profile, gap, width, height, depth, edge, groove, beading, angle, roundness, evenness, and deformation. Some specific industries include: Paint and paint inspection, rubber and tires, plastics, glass, and semi-conductor measurement. The laser scan micrometer is a valuable precision measurement tool used in a wide range of industries to obtain highly accurate dimensional data for quality assurance, product performance and to monitor variance in the manufacturing process. 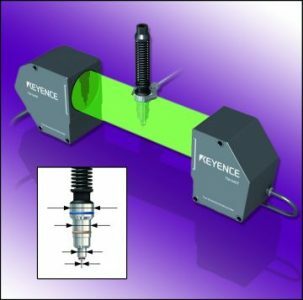 They are capable of high speed measurement, which enables them to measure moving or vibrating parts with a high degree of accuracy.